What were the most important resources for you in helping you to make your decision to study at City? 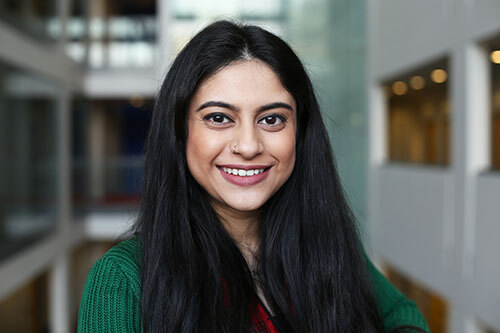 From both the application process in Year 13 and during clearing (I came to City through clearing), I felt that speaking to current students was one of the most important resources in helping me make a decision. I feel current students provide a prospective student with a true view of how university is and they will try to answer questions as honestly as possible as they can probably remember when they were in the same position. Another one of my favourite things about studying at City would be my department. Not only are all the staff highly-skilled and qualified in different areas but they are also so friendly and you tend to see them not as just lecturers but as friends. They are understanding and approachable so if I ever had a problem/question I'd never feel uncomfortable to contact them. I've been a Student Ambassador since my second year at university. In my first and second year I was part of the Pakistan Society. In my third year I took part in some events with the Bhangra Society and the Speech and Language Society. My friend and I have also started our own society this year, the British Asian Society, which aims to bring many different Asian cultures together to have a good time. My top tip would be to work hard in your first year. No matter how much it counts, it's worth it to have a balance between your academic and social life. I say this because most degrees say second year is the hardest. Therefore if you focus from the beginning, you will be more prepared for the jump into second year. My first year counted 20% of my degree and knowing that I did well that year took a lot of pressure and stress off me for second year.